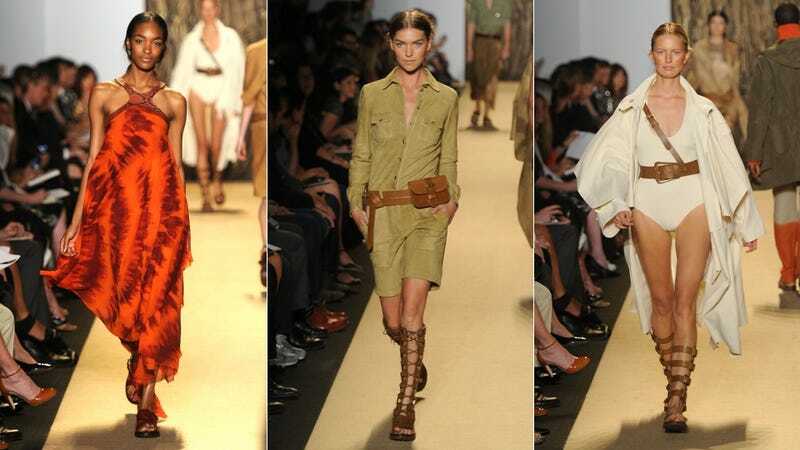 For spring 2012, Michael Kors encourages us all to go on a safari. His collection — shown Wednesday in New York — seemed inspired by explorers and wildlife enthusiasts: lots of khaki and olive, accented by animal prints and tie-dye. Here, the tie-dye is less dirty granola hippie, more "yoga retreat in Bali." And the belts with shoulder straps are cool… Although reminiscent of Rolphe from Sound Of Music. Kors is obviously hearing the call of the wild. The holey, distressed sweater with those olive tie-dye trousers is a little too "freshman up all night trying to finish a modern fiction term paper." But! The gentleman in the middle, I will take. Because he and his lavalava are smoking hot. His sarong is so right. The woman who can pull off the don't-shoot-me-I'm-not-a-deer bright orange hunting ensemble on the right is an interesting person indeed. Left to right: No. Yes. Maybe. Survivor chic! The first one doubles as a fish net. The second is for camouflaging yourself in a cantaloupe. The last ones were issued by the Dharma Initiative. That shapeless thing on the left looks like it could be great for long international flights. Let us not speak of the straightjacketdress in the center. Monochromatic lady is the new Indiana Jones. One-shoulder dress is the swimsuit coverup of my dreams. That doo-doo colored shredded cardboard crap on the end is hideous. There's something slightly fall about this spring palette, no? I'm trying to imagine what Michael Kors would say about this stuff were it to parade before him on Project Runway. "She's like a senior citizen cavegirl cocktail waitress on a cruise ship to Kenya!" What say you? Are you on board for this luxurious journey through the veldt? Or do you wish all this stuff would get trampled by a herd of water buffalo?